Can you confirm these amateur observations of Pristurus flavipunctatus? gasperetti (invalid): was described from W Saudi-Arabia (Wadi Kharrar near Makkah); Type locality: Wadi Kharrar, near Makkah, Saudi Arabia, 21° 17'30"N 40° 06'30"E, 460 m elevation. Diagnosis Diagnosis (genus): dorsal process of premaxilla relatively long, nasal bones short, extent of prefrontal bone in anterior wall of orbit reduced medially*; supratemporal process of parietal bone often expanded and fully attached to exoccipital*, squamosal often short and curved*; palatine contacting vomer narrowly*, superficial posterior margin of dentary bone not obviously tridentate, the lower spur extending far backwards*. Twenty-five or fewer presacral vertebrae; toes with primitive number of phalanges (manus – 2.3.4.5.3; pes – 2.3.4.5.4); post-cloacal bones absent. Meatal closure muscle absent; anterior nuchal muscle originating mainly on second vertebra*; pectoralis muscles on each side crossing midline*, toes without complex internal musculature. Pupil approximately round with posteroventral quadrant of border less convex, or pupil vertically elliptical with un-notched borders; dorsal scaling consisting of small granules, nearly always without larger tubercles on body; preanal and femoral pores absent, cloacal tubercles and postcloacal sacs absent; toes simple without expanded adhesive pads beneath; tail strongly compressed laterally in males*, not or less so in females; in one species (P. celerrimus) an area of dark rugose scales in preanal region of males; flanks often with longitudinal series of short dark or reddish streaks separated by pale spots*. Largely diurnal and usually heliothermic; tail often raised and moved during intraspecific signalling*; voice little used [*Asterisks indicate features that are apparently largely or wholly confined to Pristurus among the Sphaerodactylidae. Gekkonidae and Phyllodactylidae; from ARNOLD 2009]. Diagnosis (gasperetti): A moderate sized species of Pristurus with a narrow head and somewhat laterally compressed body in males, where the neural spines form a distinct ridge along the back; transverse section of frontal bone concave above, its lateral downgrowths not meeting or fusing on mid-line or extending forwards onto nasal capsules; nasal process of premaxilla not extending backwards as far as the level of the anterior margins of the orbits, the posterior margin of its palatal section forming two gentle curves rather than a strong W-shape; clear and extensive contact between the palatal sections of the maxillae behind the premaxilla, postorbital bone relatively large; nearly always 23 presacral vertebrae with the lateral sections of the anterior zygapophyses folded right over the contiguous posterior zygapophyses of the next vertebra; three sternal and one complete xiphisternal rib; nostril situated be- tween the rostral, a supranasal and one or two postnasal scales; usually one (occasionally 2-4) scales between the two supranasals, upper palpebral fold narrow and scarcely projecting, subtibial scales enlarged; tail strongly compressed in males with a sagittal fringe of long scales above that does not extend on to body, and a similar but less developed fringe below. 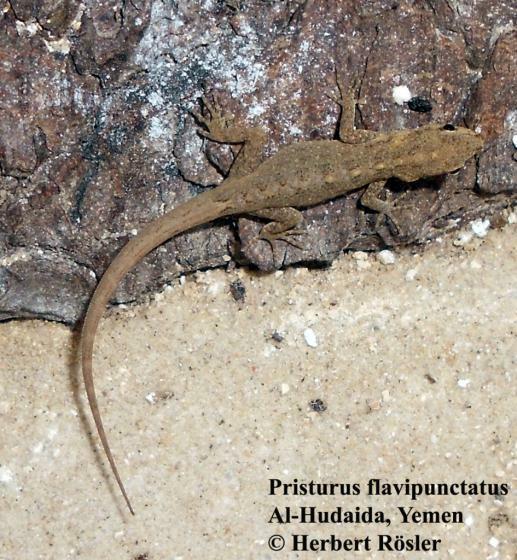 Most similar to Pristurusjlavipunctatus Riippell, 1835 but differs in the dorsal tail crest not extending on to the body, larger size (up to 38 mm from snout to vent compared with 33 mm in Arabian P. jlavipunctatus), more sombre colouring and stronger markings. Pristuruspopovi Arnold, 1982 has a broader head, a more extensive palpebral fold and less ventral tail cresting in males. Pristurus rupestris Blanford, 1874 is smaller, the downgrowths of the frontal bone meet and fuse beneath, the palpebral fold is better developed while tail fringing is often less so. In both these latter species, the transverse section of the frontal bone is not strongly concave above and the postorbital bone is smaller [ARNOLD 1986]. 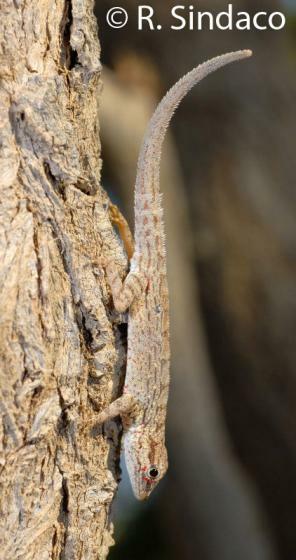 The common name of P. gasperetti is Wadi Kharrar Rock Gecko. Type species: Pristurus flavipunctatus RÜPPELL 1835 is the type species of the genus Pristurus RÜPPELL 1835. Subspecies: Pristurus gasperetti gallagheri ARNOLD 1986 has been elevated to full species. Etymology Named after the yellow spots characteristic for this species. P. gasperetti was named after John Gasperetti (1920-2001), engineer and surveyor of various companies and governments in the Middle East and Field Associate of the Department of Herpetology of the California Academy of Sciences, San Francisco.